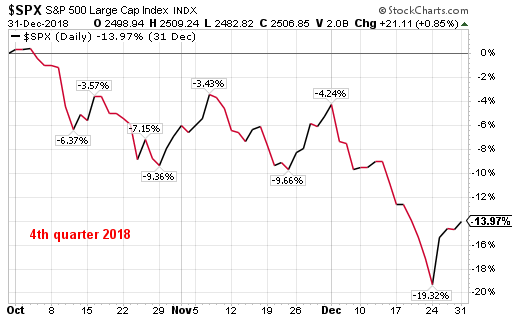 The end of 2018 saw the S&P 500 Index return decline over 13% as seen in the first chart below. 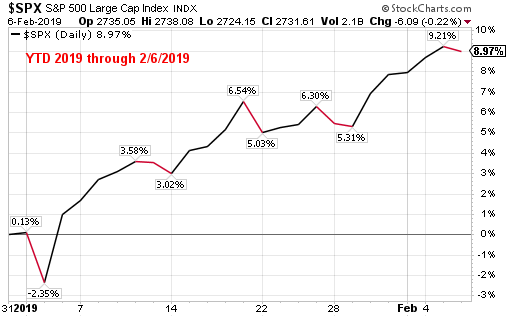 The second chart shows the snap back in the market that has rewarded investors at the start of 2019 with the price only return of the S&P 500 Index up nearly 9%. In spite of the strong returns so far this year, investor fund flows into mutual funds and exchange traded funds has been decidedly negative. 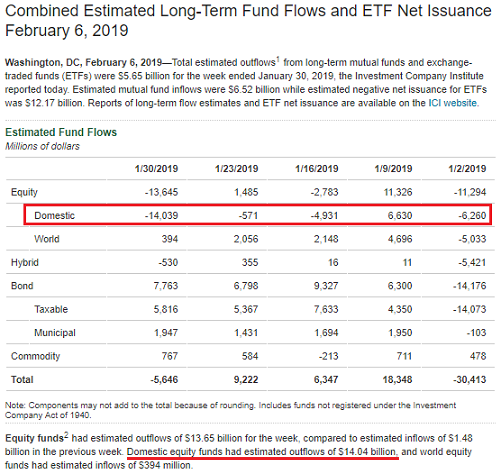 Today's fund flow report by the Investment Company Institute (ICI) reported, "domestic equity funds had estimated outflows of $14.04 billion." As the below table shows, four of the last five weeks have seen domestic equity outflows. In fact, investor outflows from U.S. domestic equity investments have been a fairly constant theme since mid 2017. 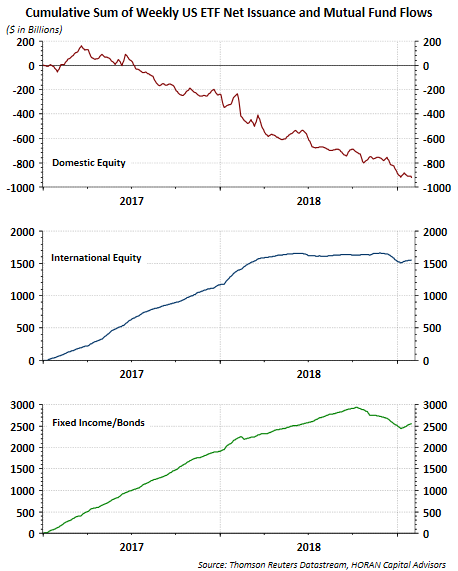 A beneficiary of the outflows has been international equities as well as fixed income or bond investments. One divergence that has developed at the start of this year is the strong equity return does not seem to have occurred at the expense of bonds as noted in the earlier fund flow chart. In a so-called 'risk on' environment, where stock investments are viewed favorably by investors, investors tend to show less interest in bonds, i.e., rates rise. 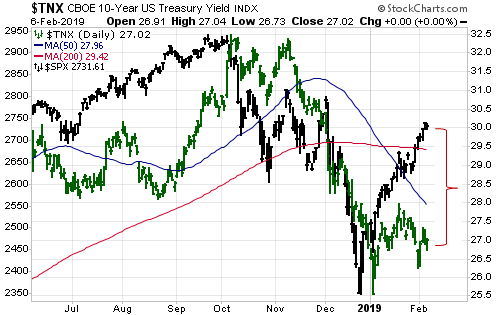 As the below chart shows though, in spite of higher equity prices, the 10-year treasury bond yield (green line) has remained fairly stable. Will this gap between the two lines close by bond prices falling (higher interest rates), or will the S&P 500 Index fall to meet the line tracing the yield of the 10-year treasury? It should be noted this gap can widen, and has remained wide at times, as long term bond yields are influenced by many other factors, such as inflation, treasury issuance, etc. As John Murphy noted ($$) though, "A stronger economy should boost bond yields as well as stocks, and encourage some bond selling. So far, that hasn't happened. While a stronger stock market encourages buying of riskier stock groups like industrials and cyclicals; lower bond yields encourage the buying of defensive stock groups like staples, utilities, and REITS."